How quick can we get up and running? The turnaround time with Sandbox is amazingly quick! Once we process the purchase our support team will contact you to schedule the training sessions. The two training sessions are scheduled at your convenience and depending on your availabilities are generally scheduled within 5 business days. Most centers are up and running in a week or two however, you may want to give yourself some extra time to get comfortable with all areas of the software before you go live. Although no information is completely safe from a potential attack online, information stored in cloud software is often more secure then on your own computer. When using cloud software, information is transferred over the internet and stored on a server remotely rather than on a local computer hard-drive. In order to protect the information as it is being transferred over the internet, companies such as Sandbox Software use SSL technology to encrypt your data. This ensures that the information can’t be intercepted while it is being sent over the internet. This is the same technology used by major banks and government agencies to protect confidential information. Once the information arrives on the server, Sandbox child care software uses Rackspace servers to securely protect the information in the child care software. Yes, we perform hourly backups of your data, which is encrypted and stored on multiple servers in case of emergency. How do I accept online payments with Sandbox? Accepting online payments with Sandbox is secure, simple and efficient. With Sandbox, your parents have two options for online payments. They can enable 'Automatic withdrawal’ which allows you to charge them right away when creating the invoices or they can apply payments a soon as they receive the invoice in their parent portal. The setup is quick, taking only a few minutes. You will just need to provide some company information and connect your bank account. It's that easy! Now your parents can add a payment method and start applying payments. How much are the payment processing fees? When using online payments through Sandbox, there are no monthly or hidden fees to worry about. We use Stripe as our merchant and the fees for credit cards are 2.9% + $0.30 per transaction and ACH (only available in US) is $0.60 per transaction (or 0.4% if less than 20 transactions per month). Do I have to pay for product upgrades? No, all updates made to Sandbox Software are published automatically, and are provided at no extra charge to our customers. These updates may include bug fixes and new features for our child care software. You can update your credit card information in Settings in your Sandbox Software account. Login to Sandbox and click 'Settings'. In Settings, click 'Payment Info'. Update your credit card information and click 'Save'. Your credit card information is now up-to-date. Please also contact our sales manager Rob at rob@runsandbox.com to inform him that your credit card has been updated. No, all payments for Sandbox Software are paid on a month to month basis and you can cancel your subscription anytime. When your subscription is cancelled, there will be no refund for the month paid in advance. Upon cancellation of your subscription future payments will be terminated immediately, and access to your Sandbox Software account will conclude one month from the last payment date. How do you enable the Sandbox Timeclock? The Sandbox Timeclock can be enabled in Settings. Take a look at these instructions for more detail on how to get started. Does Sandbox provide instructional videos? Yes, our youtube channel provides step-by-step tutorials which will help you work through Sandbox. If you need any additional help, contact our support team at 1.800.385.7930. x1 or support@runsandbox.com. What happens to my information if I cancel my subscription? All information you enter into your Sandbox account is owned by you. If for some reason you decide to cancel your Sandbox Software subscription, we can provide you with your information in CSV format so that you can import it into the new child care software program of your choice. Do I have to pay for customer support? 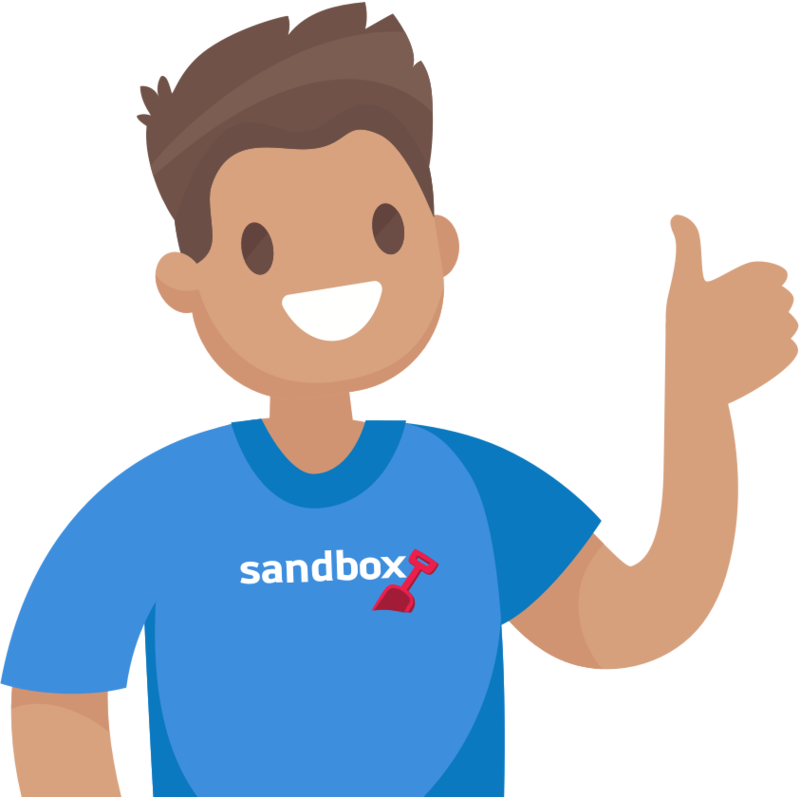 Customer support is included in the monthly fee for every user of Sandbox. We also provide full support for anyone working through our 30-day free trial. Our office hours are 9:00am to 5:00pm ET. You can call in and talk to our customer support staff anytime during our office hours. If you call after hours you can leave a message or email us at support@runsandbox.com and we will get back to you as soon as possible. Can Sandbox be purchased outright? Our software is web-based and requires on-going maintenance and updates. With the purchase of our software you also receive our unlimited customer support. Therefore our software can not be purchased, instead it is offered as a monthly subscription. For more information on the different subscriptions offered in Sandbox, please view our Pricing page. What does the $250 setup fee include? Two web-training sessions which we use to train you in the software to ensure you are comfortable in Sandbox before you're up and running. Our support team will help build your first online registration form. You can send your registration package to our support staff and we build a custom form to suit your needs. If your information is stored in a CSV or a properly formatted excel file we can often import the data to help get you set up. Please contact us for more details about a possible import. How do I purchase Sandbox? You can contact your sales representative directly or call our sales department at 1.800.385.7930 x2 and they will help you get set up. If you would like to purchase on your own time you can click the red "Buy Now" button while you're logged in to the free trial. Follow the instructions and upon completion your free trial will be converted to the full version of Sandbox immediately.